Deploy an innovative multi-layered anti-virus internet security strategy with SonicWALL firewalls and Enforced Client Anti-Virus and Anti-Spyware service. You can redirect any user with a non-compliant endpoint to a web page to install the latest Enforced Client Anti-Virus and Anti-Spyware software. Customers around the globe trust it as one of the best anti-spyware software solutions. When you are facing multiple threats from multiple locations, you need multiple layers of protection. A firewall's gateway anti-virus solution provides the first layer of defense at the perimeter, stopping most attacks before they enter the network. But viruses can still enter the network through multiple entry points. While protection at multiple layers is the best defense, deploying, maintaining and enforcing the right security software on the endpoint devices can strain IT resources and budgets. This has created the need for a manageable, enforced network-wide solution that ensures all endpoints have the latest security software updates. SonicWALL firewalls provide an innovative multi-layered anti-malware strategy consisting of its proprietary Reassembly Free Deep Packet Inspection (RFDPI) anti-malware solution at the gateway and enforced anti-virus solution at the endpoints. When a non-complaint endpoint within the network tries to connect to the Internet, the firewall will redirect the user to a web page to install the latest SonicWALL Enforced Client Anti-Virus and Anti-Spyware software. The firewall further ensures that all the endpoint clients are automatically updated with the latest anti-virus and anti-spyware signatures without end-user intervention. The software is easily deployed, automatically enforced and updated network-wide on Microsoft Windows devices through a powerful but easy-to-use policy-driven engine. Because it is client-based and maintained across the network, it protects against threats regardless of whether the endpoint is inside the corporate network or outside connected via VPN. Virus and spyware signatures are updated automatically, thus simplifying ongoing administration and ensuring reliability. SonicWALL Enforced Client AntiVirus and Anti-Spyware software is available for purchase with the McAfee or Kaspersky anti-virus engine. Automated installation and deployment of anti-virus and anti-spyware clients machineby-machine across the network is enforced by the firewall thus minimizing administrative overhead. Automated by the SonicWALL firewall, anti-virus and anti-spyware client enforcement verifies that every computer accessing the network has the most recent version of anti-virus and anti-spyware signatures installed and active, eliminating the costs commonly associated with desktop anti-virus and anti-spyware policy management. Always on, automatic virus protection keeps end-user productivity high and security management low by providing frequent anti-virus and anti-spyware updates transparently to all desktops and file servers. On-demand and scheduled scanning provides administrators with the customization flexibility to choose when additional scans are performed and how frequently the software checks for anti-virus and anti-spyware signature updates. Comprehensive web-based reporting provides information about the state of each user, historical data on past infection detections, and information on each computer's operating system. License sharing enables organizations with distributed networks of multiple SonicWALL firewall appliances to allocate Enforced Client Anti-Virus and Anti-Spyware licenses to meet changing conditions. 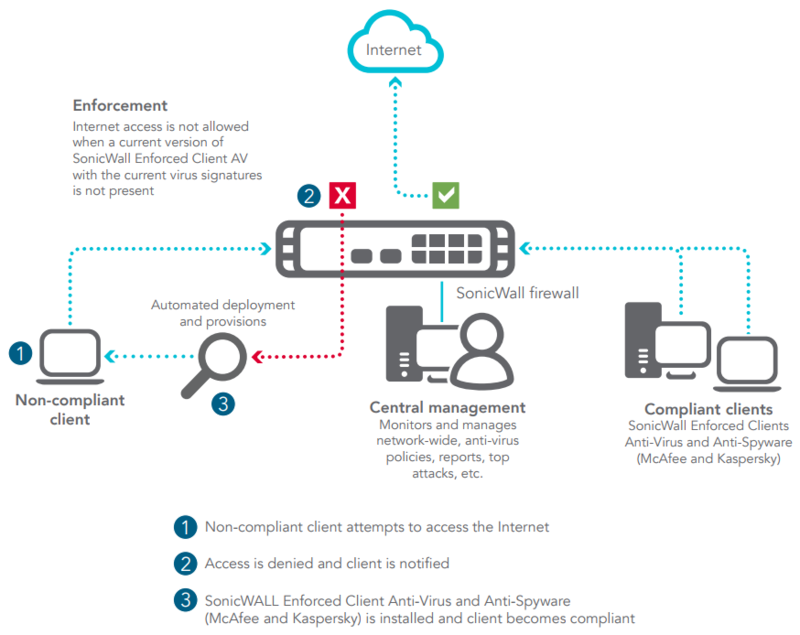 SonicWALL anti-virus policy management and reporting can be accessed through the web interface of the SonicWALL firewall appliance. It reports detailed enterprise-wide information such as coverage status summary, machines updated, viruses cleaned, and spyware detected, deleted and quarantined, as well as the currency of .DAT, engine and product versions.